MotionX®-24/7 with Sleeptracker® patented technology has been featured in The New York Times, ABC News, Dr. Phil and many more. 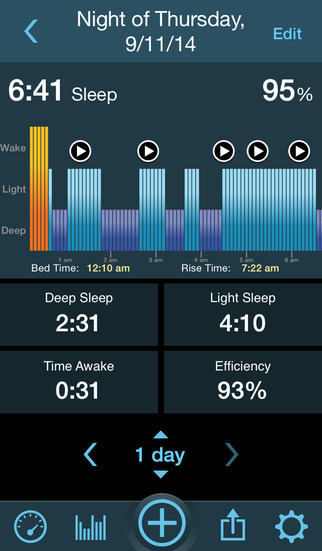 Sleeptracker technology helps millions of people sleep better every night and wake-up refreshed. Now you can improve your sleep naturally, maximize your sleep efficiency and wake up energized. 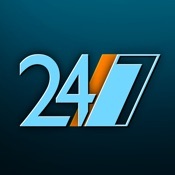 MotionX-24/7 Sleeptracker technology delivers the most comprehensive sleep solution available to consumers. Sleeptracker technology is within 95% of the accuracy of professional sleep monitors used in sleep clinics. 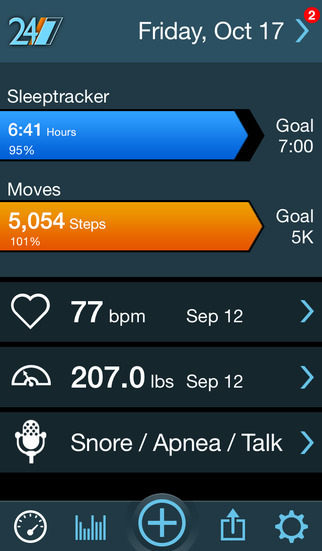 You can also record snoring or other sounds during the night to provide insight into your sleep patterns. MotionX-24/7 Sleeptracker technology vs other sleep monitors: only Sleeptracker® patented technology can help you WAKE UP AT THE OPTIMAL TIME™. Unlike other products, Sleeptracker technology doesn’t just wake you up simply because moved; it analyzes your sleep patterns throughout the entire night to wake you at the best possible moment to help you feel the most refreshed and energetic. MotionX-24/7 also monitors your daily activity level, measures and tracks your resting heart rate, tracks your body weight, and more! When analyzing your sleep, please ensure you place your iPhone according to the instructions, either in bed or in an armband, so MotionX-24/7 can accurately monitor your sleep and wake you at the optimal time. Please see the in-app guidance for placement tips. NOTE: Placing your iPhone on a solid surface such as the floor or a table while recording sleep causes 24/7 to become highly sensitive to movement. This level of sensitivity is required for users sleeping on a motion-absorbing mattress (such as Beautyrest and Tempur-Pedic). However, with the iPhone on the floor or table, noise from the accelerometer sensor can be registered as sleep cycles, resulting in a random sleep graph and random sleep statistics.